Includes one 35 lb. EZ curl barbell bar. Ader pro style curl bars are all pre-assembled to ensure that they meet the standards required in heavy used commercial applications. All of our prostyle curling bars use solid steel bolt design. bigger, longer and stronger than the competition. These curl bars feature special deep set knurling for functional performance and our top of the line Ader high grade gray or black plates. Pro-Style Fixed Weight Curl Barbells. 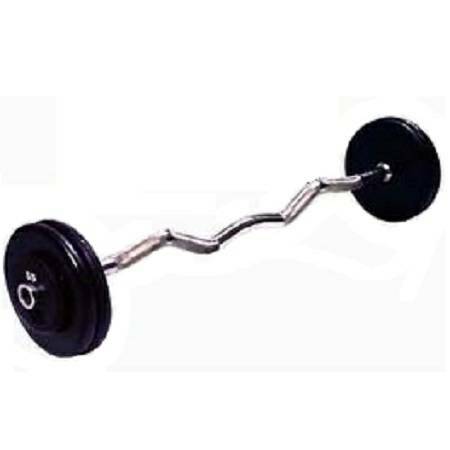 These are most often found in commercial gyms, curling barbells from 20lb to 115lb, as a convenience for users who are doing curls and other exercises and find it easier to pick up another curl barbell rather than change the weight. Like pro-style dumbbells, the weight of these is semi-permanent.